By Terry Dunn on Sept. 9, 2015 at 9:27 a.m.
Let's investigate some of the components that NASA uses to provide electrical power to their manned and unmanned spacecraft! This is the third in a series of articles that examine the real-life NASA hardware which inspired the fictional equipment found in Andy Weir's novel (and soon-to-be-released movie) The Martian. In the previous installments, we looked at the many ways in which water and air are managed in space. This time around, we will investigate some of the components that NASA uses to provide electrical power to their manned and unmanned spacecraft! The International Space Station (ISS) is a big spaceship. Its outer perimeter is about the same size as an American football field. Much of the area within that perimeter is taken up by huge swaths of copper-colored solar arrays. More specifically, there are eight individual solar arrays, each measuring 112 feet by 39 feet (34.1m x 11.9m). Each array consists of two light-collecting blankets and the truss structures necessary to keep them outstretched. The ISS's eight huge solar arrays are perhaps its most dominant visual feature. They can provide the station with power equivalent to 55 average homes. The blankets are comprised of photovoltaic solar cells--lots of them. The job of these cells is to convert sunlight to electrical energy. The vast number of these purified silicon cells (more than 250,000) reflects the immense power needs of the ISS. If you look at the combined output potential of the ISS's solar arrays (there are some smaller Russian arrays as well), it's enough power for approximately 55 average US households – that is, if the average US household utilized 160 volt DC power. There's more to harnessing the Sun's power than just unfolding nearly an acre of solar arrays. It takes careful positioning of the arrays to garner the most energy from whatever sunlight is available. That can be a difficult job, considering all of the relative movement involved with the ISS orbiting Earth and Earth orbiting the Sun. Rather than reorienting the entire ISS to keep the arrays pointing Sunward (which would be extremely energy-consuming to do), the arrays have two degrees of rotational freedom. The alpha gimbals (also called the Solar Alpha Rotary Joints – SARJ) allow rotation of the main truss structures that support four solar arrays on each side of the station. These are the primary joints used for solar tracking. Each of the solar arrays can be rotated on two axes to provide optimum orientation with the sun. Yet, the arrays are sometimes positioned with other goals in mind. There are also four beta gimbal joints that permit pairs of arrays to rotate on an axis perpendicular to the main trusses. With these alpha and beta movements, the arrays can stay in an ideal orientation regardless of the relative positions of the Earth, Sun and ISS. This optimum position is not necessarily that which gathers the most sunlight. Even though the ISS orbits roughly 250 miles above the Earth's surface, there is still enough atmosphere present at that altitude to put aerodynamic drag on Mission Control's list of things to worry about. There may be times when orienting the arrays to fine tune the ISS's drag profile trumps sunbathing. There are also times when flight controllers reposition the arrays to prevent the exhaust plumes of docking vehicles from contaminating the solar cells. Another reason that sun-catching sometimes plays second fiddle has to do with the material properties of the arrays themselves. The spindly, collapsible truss structures that keep the outstretched solar blankets taut are delicate by nature. If the arrays are configured such that part of a truss is in direct sunlight while the rest is in shadow, the temperature gradient between the two sections could be as much as 500 degrees (-250F to 250F respectively). Such a delta poses obvious concerns over the structural integrity of the truss. For that reason, flight controllers actively avoid orientations that would create this "longeron shadowing" scenario. Astronaut Steve Bowen works to clean and lube one of the ISS's Solar Alpha Rotary Joints during the STS-126 mission. Even with the best array positioning, the Earth's shadow makes it nearly impossible to keep the ISS in sunlight for an entire orbit. On average, about 35 minutes of each 90-minute orbit is spent in darkness. Large banks of nickel-hydrogen batteries provide power for the ISS during these eclipse periods (16 per day). The batteries get recharged once the station's arrays find sunlight again. Readers of 'The Martian' will recall that solar arrays and batteries were the prime source of electrical power on the fictional red-planet outpost. That makes sense given the predictable performance of these devices and NASA's long history with them. Yet, when we consider solar power on future Mars missions, there are a few variables to contend with. One of the primary factors with solar arrays (and the reason they are not used on deep-space missions) is that light intensity decreases as you move further from the source. More specifically, light intensity decreases as the inverse of the distance squared. Put another way: at twice the distance from the Sun you get one fourth the power from solar arrays. With all else being equal, the ISS's massive set of solar panels would produce a mere 40% of their Earth-orbit power levels if placed on Mars. Mars is 60% further from the Sun than Earth. With all else being equal, the ISS's massive set of solar panels would produce a mere 40% of their Earth-orbit power levels if placed on Mars (ignoring any additional degradation due to Martian atmosphere, dust, array orientation, etc.). That is not to propose that a Martian base would require the 22 houses' worth of power that an ISS-sized array would deliver. Yet, the presumed power needs of a hostel on Mars suggest that a sizeable and perhaps unwieldy solar farm will be necessary to support any long-term stay by humans. Another factor to consider is the efficiency of the solar cells in converting light to electricity. The units on the ISS are now rather old and can claim only 14% efficiency. Newer designs make use of a broader spectrum of light and can approach 30% efficiency. I'm am not aware of any plans to upgrade the arrays on the ISS. 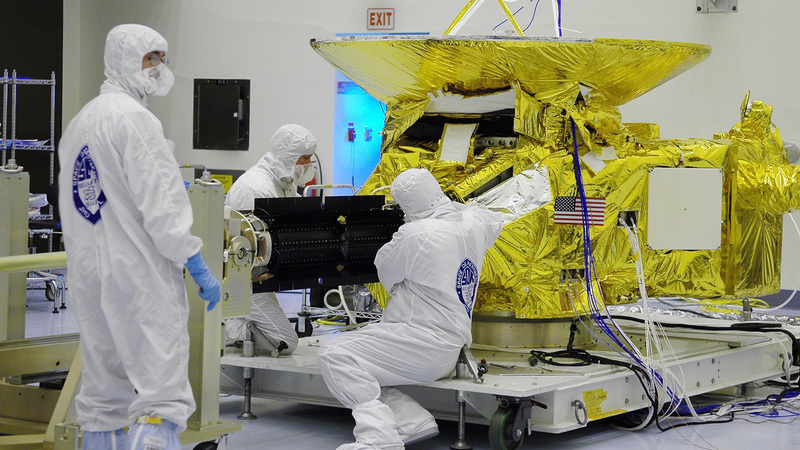 The current units satisfy the demand, so it would be very difficult to justify the financial and astronaut-hour costs of designing, launching, and installing new arrays. I think it is feasible, however, to consider that these improved-efficiency cells (or even better) will be available by the time we are ready to execute a manned Mars mission. Advanced solar arrays will go a long way towards reducing the necessary acreage of the Martian solar farm. Like the ISS, a Martian outpost requires some type of battery storage for periods of darkness. At the rate that battery technology is currently progressing, it would be foolish to even speculate what might be practical in 15-20 years when an actual manned Mars mission could lift off. 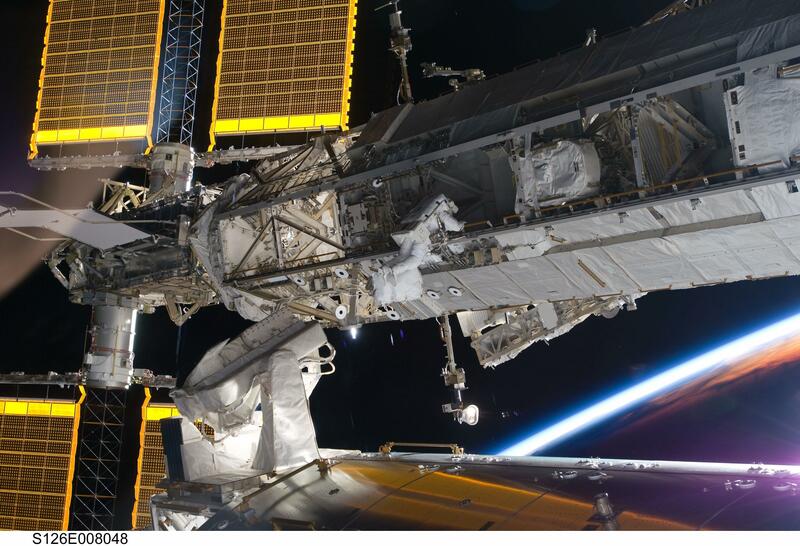 Unlike the solar arrays, the ISS's batteries are destined for an upgrade. The current nickel-hydrogen batteries are scheduled to be replaced by lighter and more efficient lithium-ion batteries beginning in the summer of 2016. The overall electrical system of the ISS can be divided into two basic parts: the Primary Power System, and the Secondary Power System. 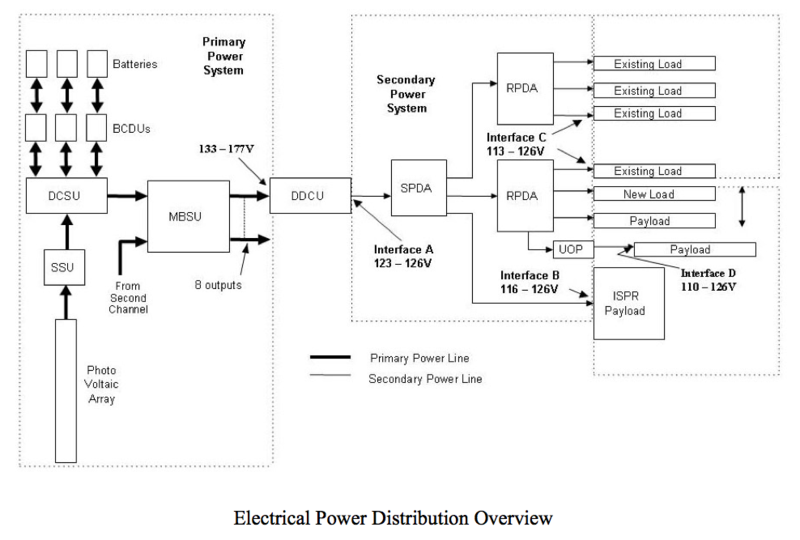 The primary system contains all of the components that are related to the creation and storage of electrical energy, such as the solar arrays, batteries, battery charging circuits, Main Bus Switching Units and components called Sequential Shunt Units (SSU). The SSUs provide a stable resistive load to the circuit as operational demands vary and they are also the first of several layers of voltage regulation. The ISS's electrical power system is divided into two high level systems: primary and secondary. Redundancy is a key element of the overall design. The Secondary Power System components manage the distribution of power to the myriad circuits and electrical gadgets within the habitable, pressurized modules of the ISS. DC-to-DC Conversion Units drop the 160 volt feed coming from the primary line to approximately 120 volts. Further downstream are Secondary Power Distribution Assemblies, which dole out voltage to Remote Power Control Modules (RPCM). RPCMs are the switches that direct power to specific components. Even though the power comes in at 120 volts DC, not all of the components operate at that voltage. 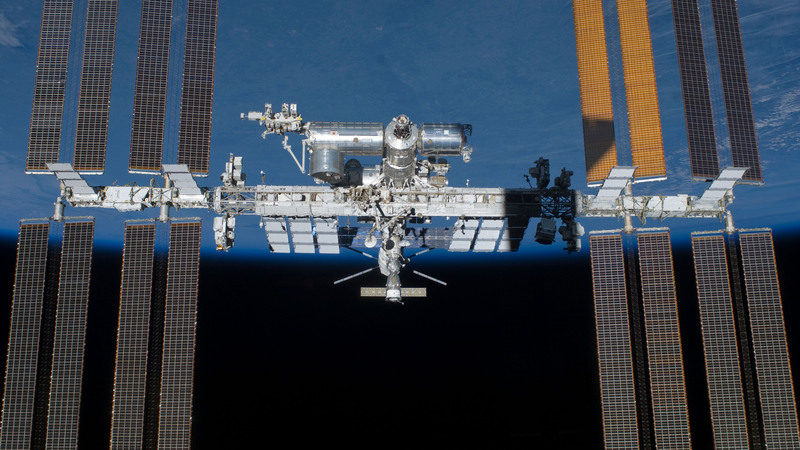 In the early stages of ISS construction, before the large solar arrays were part of the system, a small set of Russian solar arrays provided electricity. These arrays produced 28-volt DC power. Many of the legacy components on ISS are designed to work at that voltage. Additionally, there are numerous electrical devices that once interfaced with the space shuttle…another 28 volt spacecraft. Additional DC-to-DC converters are utilized to ensure that each component is fed the proper operating voltage. Much of the ISS's power system architecture reflects a focus on redundancy rather than simplicity. Much of the ISS's power system architecture reflects a focus on redundancy rather than simplicity. In many cases, failed devices can be isolated from the rest of the circuit. This prevents one bad apple from spoiling the whole bunch. In other scenarios, critical components can be powered by alternate circuits when the need arises. Most of the day-to-day management of the RPCM switches and other power management devices is carried out remotely by ISS flight controllers. Yet, some power system contingencies require crew members of the ISS to actually manhandle meaty wire jumpers to reroute electrical circuits. One of the other electrical power sources in 'The Martian' is a portable nuclear device. While this may seem like pure science fiction, NASA has been using such gadgets, called Radioisotope Thermoelectric Generators (RTG), since 1961. In fact, there are already a few of them on Mars. The Viking landers that reached the red planet in 1976 utilized RTGs, as does the Curiosity rover that is currently exploring Mars. 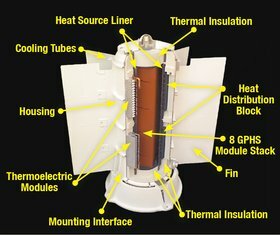 Radioisotope Thermoelectric Generators use the heat from decaying radioactive material to provide moderate, but long-term electricity to spacecraft. RTGs work by utilizing the heat from naturally decaying radioactive material. 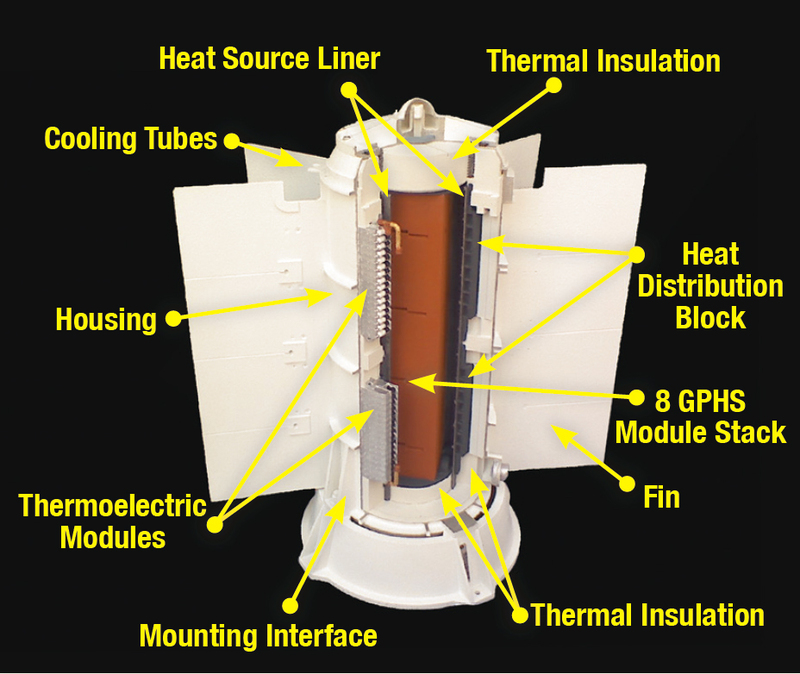 Thermocouples convert the heat to electricity. The radioactive substance decays very predictably over a long time. This provides a reliable heat source which enables RTGs to operate dependably in the outer reaches of space. Modern RTGs measure about 25 inches in diameter by 26 inches tall. The 94 pound device radiates 2000 watts of thermal power while producing 110 watts of electricity. 5.5% efficiency isn't really something to brag about, but it's the prime reason that RTGs also make fabulous space heaters. While there are a handful of radioactive materials that could be utilized in RTGs, none are quite as well-suited as Plutonium-238. It has a long half-life of 88 years and doesn't require extensive radiation shielding. The issue with the "popularity" of plutonium-238 is that it has become very scarce. The current pantry is sufficient to build only three more RTGs. One of those is earmarked for a Curiosity-like rover that is planned to launch for Mars in 2020. Unless the remaining plutonium-238 is being squirreled away for manned missions to Mars, it seems that any RTGs used on those flights will have to settle for a lesser fuel. Andy Weir's prediction of solar and RTG power for a manned Mars outpost is a sound one. NASA has many ways of producing and storing electrical power for spacecraft. Each has its own ideal application and limitations. Weir's prediction of solar and RTG power for a manned Mars outpost is a sound one. As time and technology march on, I will be excited to see how the electrical power solutions for an actual Mars mission play out. And one final note--much thanks is due to ISS flight controller Tom Sheene for providing me with in-depth descriptions of the ISS electrical systems. You'll be hearing a lot about Tom and the role of flight controllers in the next article of this series! All images appear courtesy of NASA.